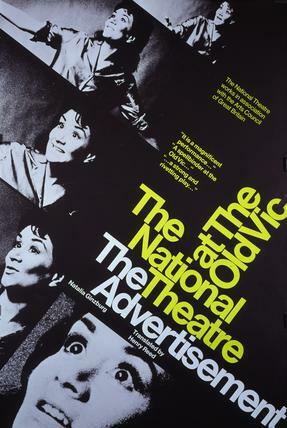 Diehard fans of Joan Plowright (or Natalia Ginzburg) may be interested in these posters offered by the National Theatre Archive. They're from the 1968-69 run of Ginzburg's play, The Advertisement, translated and adapted by Reed. The production was directed by Donald MacKechnie and Sir Laurence Olivier, and starred (besides Dame Joan) Suzanne Vassey, Louise Purnell, Edward Petherbridge, Anna Carteret, and Sir Derek Jacobi. The National Theatre also has an extensive, searchable catalog of performances and items in their archives. Here's an interesting bit of trivia: a Collected Poems of Henry Reed was proposed as early as 1979, seven years before his death. Much of this relates to Robert Herrick's Selected poems, edited by Jesson-Dibley as part of the Fyfield series and published in 1980. Includes references to: Schmidt's initial suggestion that Jesson-Dibley undertake the project, and suggestions put forward by both men of potential poets for Jesson-Dibley to edit; the possibility of editing a Fyfield volume of Edward, Lord Herbert of Cherbury's verse; Jesson-Dibley's suggestion of a volume of lives and anecdotes of seventeenth-century poets; the ultimate selection of Herrick, and plans for the book's content and arrangement; his progress; and the contract. Other topics include: Jesson-Dibley's attempts to find a publisher for a novel he has written and Schmidt's advice on this; the possibility of Carcanet undertaking a Collected Poems of Henry Reed; a play Jesson-Dibley has completed called Ahab and his neighbours; his other work, including some teaching; and Schmidt's book An introduction to fifty modern poets (1979). In his book Reading Modern Poetry, Schmidt asks: 'Will Henry Reed ever be more than an anthology piece and a brilliant parody?' We'll see. Carcanet inherited Oxford University Press's Oxford Poets list in 1999, following OUP's decision to drop contemporary poetry. There is a glimmer that Carcanet intends to reissue Reed's Collected Poems as a paperback in 2007, bringing the book full-circle. I dug through my bookshelves tonight, hunting for my copy of A.S. Byatt's Possession. Ah, here it is: the trade paperback from before the (regretable) film version was released. I've read it twice, and the spine is creased and the corners dulled. When I first read the book, straight through in about two days, I was sure it was a masterpiece (despite the sometimes tedious Victorian verse). On second reading, I was dismayed that it didn't quite captivate me in the same way, and I attributed the discrepancy to my own deprivations the first time around. Could I see your card index, Beatrice?" "Oh, I don't know, it's all a bit of a muddle, I have my own system, you know, Roland, for recording things, I think I'd better look myself, I can better understand my own hieroglyphics." She put on her reading glasses, which dangled over her embarrassment on a gilt-beaded chain. Now she could not see Roland at all, a state of affairs she marginally preferred, since she saw all male members of her quondam department as persecutors, and was unaware that Roland's own position there was precarious, that he hardly qualified as a full-blooded departmental male. She began to move things across her desk, a heavy wooden-handled knitting bag, several greying parcels of unopened books. There was a whole barbican of index boxes, thick with dust and scuffed with age, which she ruffled in interminably, talking to herself. "Nothing under La Motte. No, wait a minute. Here. A cross-reference. We need the reading box. It's very theological, the reading box. It appears"—she drew out a dog-eared yellowing card, the ink blurring into its fuzzy surface—"it appears she read The Fairy Melusina, in 1872." She replaced the card in its box, and settled back in her chair, looking across at Roland with the same obfuscating comfortable smile. There you have it: the entirety of my formal training in literary research. I was brought back to Possession this evening by stumbling across Pile of Indexcards, which lovingly blogs, in painstaking detail, a similar system of organization. 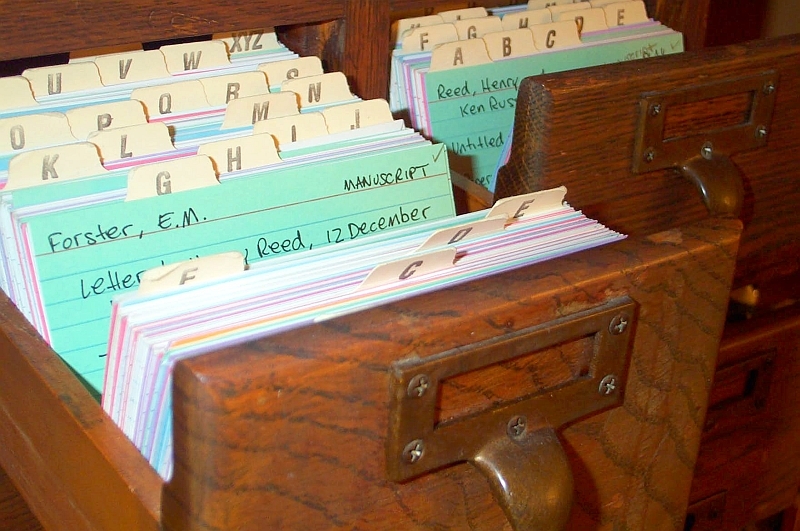 Indexcard + Tagging + Chronological order = "Indexcarding". Accompanied by a terrific photoset on Flickr. I particularly like the tagging and starring methods.